ThoYu got the order of automatic pallet block production line from Romania. The following will give more details about the order. 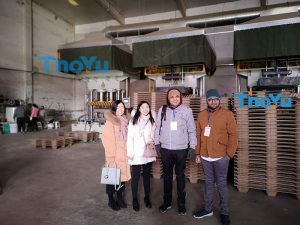 And our Romania customers had contacted us in October, and they visited ThoYu pallet block machine factory in November. We and our customers visited our manufacturing plants and customer production sites of wood pallet block machine. And they greatly appreciated our continuous improvement of the latest technology to produce higher quality and high-tech equipment. Besides, ThoYu also takes customer feedback seriously. And ThoYu optimizes hot press block machine according to these feedback. During the visit of Romania customers, we recommend fully automatic production lines to them. Finally, they are very satisfied after the inspection of our factory and equipment site. At last, we had signed the contract last week. In addition, we plan to ship all the machines in late January. And we also follow the latest news. We designed and allocated the whole automatic block production line according to Romania customers’ need. And all machines are 5 sets of pallet block machine, high efficiency wood crushing machine, rotary drum wood dryer, automatic wood glue mixing machine, automatic quantifying and feeding system, and automatic block cutting machine, and so on. Wood crushing machine is to prepare raw materials for the whole production line. And it can crush all raw materials into 5*5 mm and smaller than 200 mm for the further processing. Rotary drum wood drying machine is to dry the moisture under 10%. Glue mixing machine is to mix the material with glue evenly, and the ratio of material to glue is 85:15. Automatic quantifying and feeding system is to automatically quantify the material and feed them into the block machine. Automatic block cutting machine is to cut the half-finished long strips into blocks according to your requirement. Pallet block machines are the key equipment in the whole production line, and with hot temperature and high pressure. 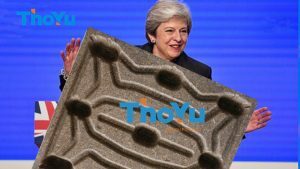 And it is also the patented product of ThoYu. The Romanian customers trust our technology and machines completely. And they are planning to produce high quality pallet blocks for their wooden pallet factory. Hence, all machines of ThoYu will not let them down. The whole block production line is adopts mechanical, pneumatic and electrical integration. And it can achieve all the process automatically controlled by PLC system. Besides, all production data can record and recall any time. Meantime, you can save labor cost with safer production. At the same time, it also can reduce production accident. The capacity of pallet block machine is much higher than the last generation, and it is more economical of large capacity. And the capacity is almost 6 m3 in 24 hours. What’s more, one machine can produce two size blocks. The final pallet block is meeting the E1 grade, and free fumigation. And block comes with excellent water proof quality so that it could soak in water 48 hours without cracking. Besides, blocks are nice appearance, smooth surface and uniform size is already to export. If you want to get the latest quotation, please send email to us.